The founder of Alvarez Construction Co. Inc., Jairo Alvarez Botero immigrated to the United States at the age of twenty-five with only one hundred dollars in his wallet and went on to build one of the largest homebuilding and development companies in the state of Louisiana. Today, the late Mr. Alvarez’s legacy lives on through his wife, Anita, and his children, Carlos, Ana, and Sebastian, all of whom work together to manage the family business. This book is available at most bookstores and also online from Amazon and Barnes & Noble. Jairo Alvarez came to the United States after having served as an officer in the Colombian Army for many years where, in the early 1960s, he was charged with the protection of Presidents Alberto Lleras Camargo and Guillermo León Valencia. On arriving in the U.S. at age 25, Jairo struggled to learn the language while working his way through college. After graduation, he returned to Colombia to start a family and began his first construction company. Many years later, he returned to the United States, determined to live the American dream. Today, his family continues his legacy by following his example of hard work and perseverance. 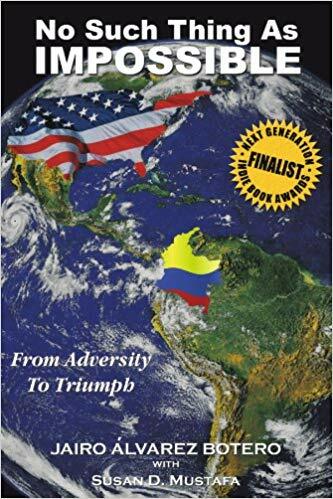 Jairo published No Such Thing As IMPOSSIBLE: From Adversity to Triumph – a thrilling autobiographical account of his journey toward the American dream. Hailed for its powerful message of personal triumph, Jairo’s book has inspired thousands of readers to face adversity with strength and confidence. Jairo’s inspirational message was borne from his own life experience: what he faced, what he learned and how each new challenge gave him an opportunity to better prepare for the next. Not inclined toward self-pity or excessive introspection, Jairo enthusiastically advocated his “Triple A Formula” when faced with adversity: Accept the situation; Adapt as necessary; and finally, take Action to overcome the adverse situation. While the formula requires significant discipline and mental fortitude to follow, Jairo’s success in life is proof that it works. As an example, only 95 days after intensive prostate cancer surgery, Jairo participated in a cycling competition… and won the race.